Margie Miklas is an American writer with a passion for travel and in particular, Italy. 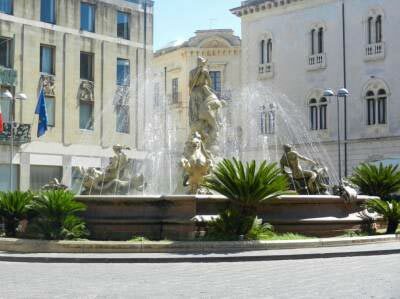 Today we are honoured to feature her post about travelling to the city of Siracusa in Sicily. Like many Italian cities, Siracusa is comprised of several sections, one being the centro storico or historic center, and the others including the newer and more modern parts of town. This was my first visit to Siracusa, but will certainly not be my last. I had been advised not to miss the island of Ortigia, which is the historic section of the city. I could not have been given better advice, because I was fascinated by its winding alleys, impressive piazzas, friendly people, and ancient temples. The island of Ortigia is only one kilometer by 600 meters wide and is separated from the remainder of Siracusa by a narrow strip of sea water. Acess to the mainland is by any of three bridges and cars can navigate Ponte Umbertino, although some of the narrow streets are best navigated on foot. After strolling through Piazza Archimedes and marveling at the sculptural masterpiece, the Fountain of Diana, I wandered around the bend and found myself in narrow alleys surrounded by three-story high dwellings. I was captivated as I watched Sicilian residents go about their everyday business of hanging laundry outside or lowering a rope with a basket, or panaro to retrieve a purchase from a street vendor. During my travels in Italy I have learned that the Sicilian people make use of everything, and nowhere was this more clear than in an alley where I found a beautiful arrangement of flowers and green plants in an abandoned sink. Somewhere else this might be frowned upon, but here it adds to the appeal and charm of Ortigia. The most well-known landmark here is the Duomo or the Cathedral of Siracusa. Gleaming in all its glory, this brilliant white edifice is the focal point in Piazza del Duomo, considered to be one of the most beautiful baroque piazzas in Italy. Stunning on the outside with its Doric columns, the inside is definitely worth the two euro cost of admission. This ancient cathedral is significant for its history as it once was the Temple of Athena. 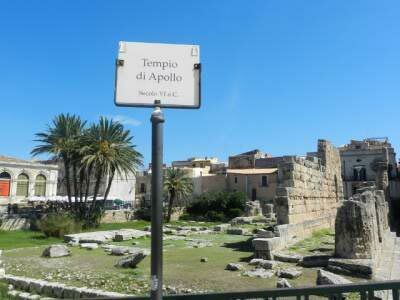 Another historic site on Ortigia is the seventh-century BC Temple of Apollo. I was amazed to find these ancient ruins in the middle of a city. Impressive that much of it is still visible and intact, this site is part of what makes Ortigia and Siracusa a UNESCO World Heritage site. The ancient Greek amphitheatre for which Siracusa is famous is located on the mainland and is a definite must-see for its archeological value. Also dating back to the period of the third and fifth centuries BC, this theatre was cut out of the rock and still has many rows of intact seats. Remarkable! Since there is so much more to discover here, I will definitely return to Siracusa on my next trip to Sicily. If you have the opportunity I would highly recommend this original Greek colony on the southeastern tip of Sicily. Margie Miklas is an American writer with a passion for travel and in particular, Italy. She is the author of Memoirs of a Solo Traveler – My Love Affair with Sicily and My Love Affair in Sicily.